Newenglish Design is launching an ad campaign for Honda’s all-terrain vehicles this week. The project continues the consultancy’s 12-year association with Honda and will be rolled out to include the client’s marine, energy, and lawns and gardens divisions. The ‘Whatever you do, make sure it’s a Honda’ concept builds on display material developed by Newenglish for the Southampton Boat Show last month. 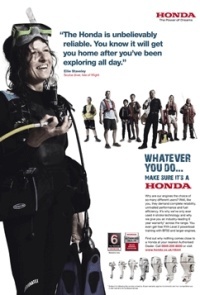 The print, online and in-store campaign features portrait photography of various Honda customers, which highlights the diversity of uses for the product. In each ad a different customer is shown in the foreground with a quote. Each print ad contains a different URL that takes users to a relevant page on the Honda website. 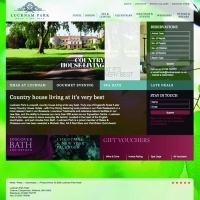 These pages are targeted at specific types of customer, but are all linked. The campaign will be extended to cover the client’s outboard motors next month, and its garden equipment and generators next year.